We had three main reasons why we wanted to visit Bangkok: temples, food and shopping. One of the modern attractions that we went to when we were in BKK is Asiatique The Riverfront. It is a large open-air mall in Bangkok, Thailand. It occupies the former docks of the East Asiatic Company, and faces the Chao Phraya River and Charoen Krung Road. The complex opened in 2012 after extensive renovation of the site. The Denmark-based East Asiatic Company was founded in 1897 and was one of several Western firms conducting trade with Siam at the time. The company owned port facilities on the Chao Phraya, which included several warehouses, the oldest extant building dating from 1907. The port ceased operations in 1947, and the facilities later fell into disuse. In May 2011, real estate company TCC Land announced its plans to renovate and develop the site into a retail/entertainment complex to be known as Asiatique The Riverfront. The 12-acre property houses around 1,500 shops and 40 restaurants. Asiatique opens at 4:00 pm and closes at 12 midnight. This was included in our original itinerary but was a tentative destination. We were torn between doing the Chao Phraya River Cruise and watching a Muay Thai Live Show. But after shopping around Bangkok's China Town my friends decided that they wanted to see the Muay Thai Show instead. I found the show ticket prices a bit steep for a stage show and that pictures and videos are not allowed. So I decided to forgo the show and just roam around the property instead. The mall's layout is divided into four thematic sections, called districts. Chareonkrung District is named after Charoen Krung Road; Town Square District features foreign restaurants and sports bars, and includes a small event space; Factory District focuses on trendy fashions, products and restaurants. Waterfront District lies along Asiatique's waterfront promenade and includes several riverside restaurants, a large event space used for concerts, festivals and New Year celebrations, and Asiatique Sky, the tallest Ferris wheel in Bangkok at 60 meters (200 ft.) Chareonkrung District, once the old trade centre, is now ‘a new road to the country’s modernization’. 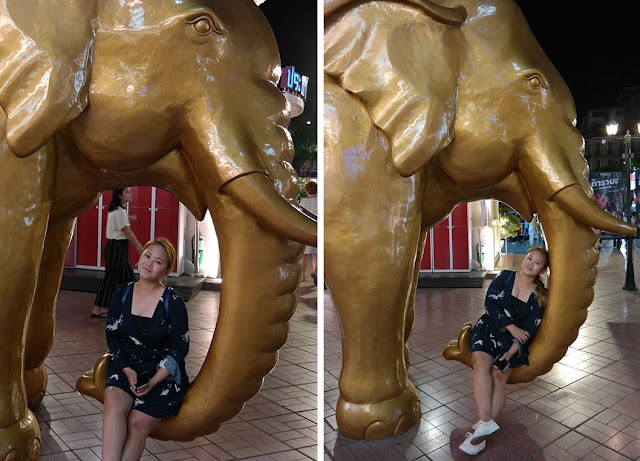 Find both traditional and modern Thai culture through performing arts, Thai puppets by Joe Louis Theatre, Calypso Show and MuayThai Live show as well as more than 1,000 retail shops selling Thai handicrafts, souvenirs home décor and spas. Town Square District blends Thai and Western ways of life, with an international dining scene and sports bars. There is also space for events and activities, including sports, games and product launches. Factory District is the area for fashion showcases, a hip dining scene and shops selling all kinds of design products from clothing to gadget. The focus is on modern lifestyles born after the ‘Industrial Age’. Waterfront District, the main highlight at Asiatique: The Riverfront, is essentially the development of Bangkok’s riverside from a center of trade to tourism. International fine-dining establishments occupy the areas along the riverbanks, while the city’s longest public boardwalk (300 meters) is lined with restaurants and events venues. This is also where the concerts, festivals and the New Year’s countdown celebration take place. I literally walked along every alley and checked out every shop while I wait for my friends. They have so many great items there, good thing is that I was able to control my shopping urges and just bought a couple of things and some souvenirs. And of course I drank my fave Thai Milk Tea and ate my fave mango sticky rice while I people watch and it was the best as always!